Round 1: Algieri showed much movement around the ring. Many of the analysts did not like this kind of his style. He made limited engagements and Pacquiao got the better of him most of the time. Not much of hard punched people are looking forward to. Round 2: Algieri went down after receiving power punch from PacMan. The referre decided to call it a knockdown. Round 3 ended with scorecard 30-26 still ib favour of PacMan. 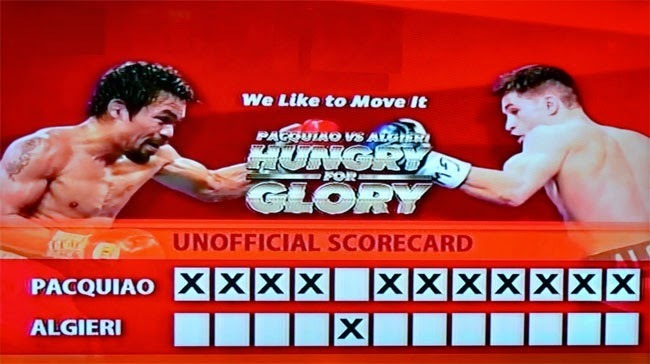 Currently scorecard still in Pacquiao's side. The crowd cheering loudly for PacMan. Round 6 Algieri down after a left given by Pacquiao. Hard left from Pacquiao earbed him more cheers from the crowd as Algieri tumbled down. Three knockdowns scored against Algieri. Pacquiao continues to give gaps toward Algieri's face. Round 7 Powerful shots continues to fire away. Pacquiao punching on Algieri's mid section. Round 9 Algieri down again in 9th round. Last 30 seconds of 9th round was used by PacMan to bring down Algieri. Round 10 Algieri down once again. Round 12 Algieri's corner kept on cheering him. More combos landed on Algieri before the bell rang.